Obama: N. Korea 'real threat', urges co-operation - SABC News - Breaking news, special reports, world, business, sport coverage of all South African current events. Africa's news leader. Former U.S. President Barack Obama and Japanese Prime Minister Shinzo Abe pose for photographers in front of Japanese Sushi restaurant in Tokyo's Ginza shopping district, March 25, 2018. Shizuo Kambayashi/Pool via Reuters? North Korea poses a “real threat” whose solution will require international co-operation, former US President Barack Obama said Sunday on a visit to Japan. Obama also said the US needed to ensure there was a defence system in place to protect countries in the region from a potential attack from North Korean missiles. “North Korea is a real threat” and has developed a weapons programme and delivery system that “poses a significant threat not just to the region but to the whole world”, Obama said in a speech in Tokyo. “So far, we haven’t seen as much progress obviously as we would have liked. But the one thing that is very important to recognise is that individually, no country can solve this problem as effectively as if we all work together,” Obama stressed. He said North Korea was “a country that is so far removed from the international norms and so disconnected with the rest of the world” that it was particularly difficult to put pressure on the isolated regime. Under the Obama administration, Washington pursued a policy of “strategic patience” towards the North in hopes that sanctions would bring Pyongyang to heel and force it to abandon its weapons ambitions. But during that time, a string of nuclear tests and missile launches amply demonstrated the ineffectiveness of the sanctions regime in addressing the issue. Obama is on a swing through Asia which has already taken in Singapore, New Zealand and Australia. He has largely avoided the limelight, playing golf with former Prime Minister John Key in New Zealand and offering parenting tips to the current leader Jacinda Ardern, who is pregnant. 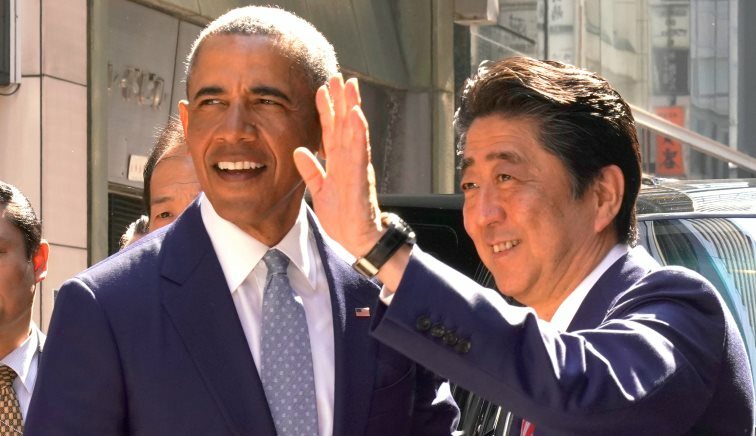 Later Sunday, Obama met Japanese Prime Minister Shinzo Abe for lunch, sparking memories of their 2014 “sushi summit” when the American was still in the White House. Obama reportedly talked business and trade throughout the 2014 meal, which was supposed to be an informal opportunity for bonding between the two world leaders. The then-president emerged to tell waiting reporters “that’s some good sushi right there” but reportedly ate only half of his Michelin-starred offerings. This entry was posted on 25 Mar 2018,10:43AM at 10:43 AM and is filed under World, News, Homepage Featured Story Slider. You can follow any responses to this entry through the RSS 2.0 feed. Both comments and pings are currently closed.